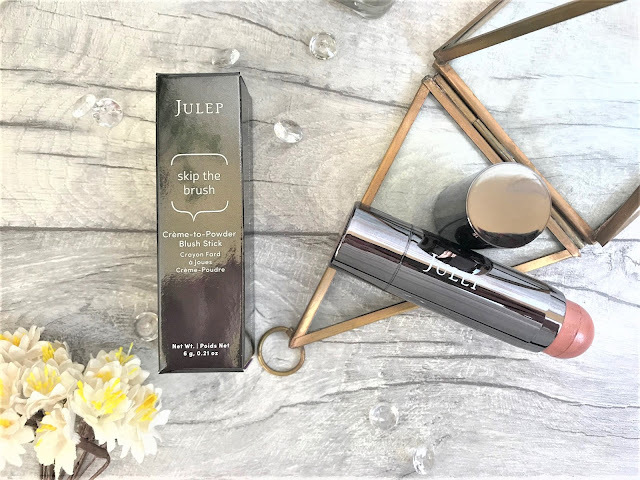 A brand which I have seen around and about recently is Julep, and never having tried anything from them before, I recently snapped up a Julep TSV deal on QVC as the price was too good to resist and the kit had a good range of products to enable me to try the brand. 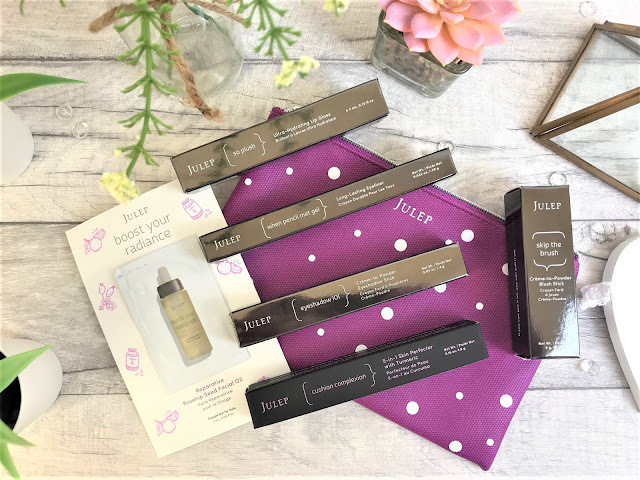 You receive a purple spotty makeup bag with the kit and a sample of the Julep Reparative Rosehip Seed Facial Oil to try, which is great for people like me who haven't tried the brand before. The kit also contains five full sized products, an Eyeshadow Stick, a Lip Gloss, a 5-in-1 Skin Perfector, an Eyeliner and a Blush Stick. All of the packaging is super sleek and metallic and looks really expensive and high-end. The first product I tried out was the Julep Creme-to-Powder Eyeshadow Stick which came in the shade Copper Shimmer. The colour is a pretty shimmering golden brown and is a twist-up shadow which also comes with a smudging sponge on the opposite end if you are wanting to create a smokey eye look. The formula is super soft and blends so easily, and is full of pigment to give a stunning eye look with just one swipe. We then have the Julep Long-Lasting Eyeliner in the shade Rich Brown. Normally I would use a black liner, but as I am quite fair skinned and fair-haired, I did actually really like this slightly more natural look. The shade is a matte espresso brown and it has a water-resistant formula, making it perfect for waterlines and as a contact lens-wearer I was really impressed with the longevity of this as a lot of eyeliners will just disintegrate due to my watery eyes but this one didn't. 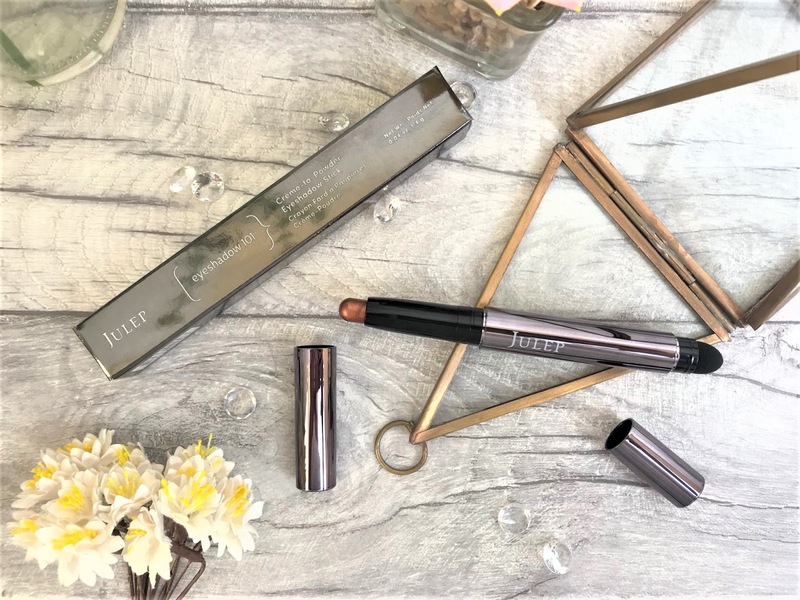 My favourite product is the Julep 5-in-1 Skin Perfector, which is available in eighteen shades, which I find really impressive, as with a lot of concealers, you have some give and take with shades, so this should definitely cover the majority of skin tones out there. 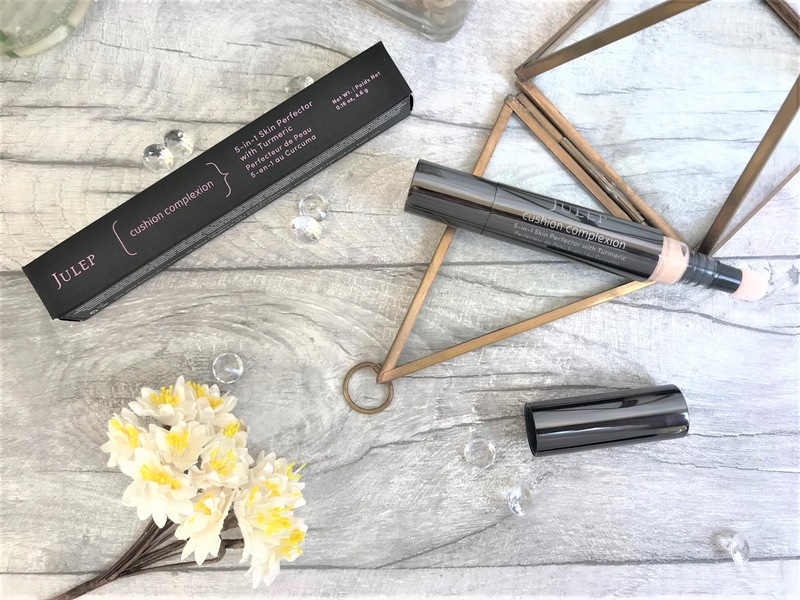 This is a multi-tasking product which conceals, corrects, illuminates, blurs and brightens the complexion and gives a medium to full coverage and a demi-matte finish. The shiny metal tube consists of quite a lot of product, and a twist-up system that projects the formula into the sponge tipped applicator. This helps you get a lovely blend with the Skin Perfector. I opted for shade 110 Porcelain as I am fair and I always go as light as possible to conceal with, especially for the under-eyes to really brighten the skin. I am not always keen on cream blushers, but the Julep Creme-to-Powder Blush Stick in Rose Gold is a really pretty shade. It has a pale pink-copper sheen to it and really illuminates the skin without sliding around the skin as it dries to a slightly powdery finish to keep it in place. 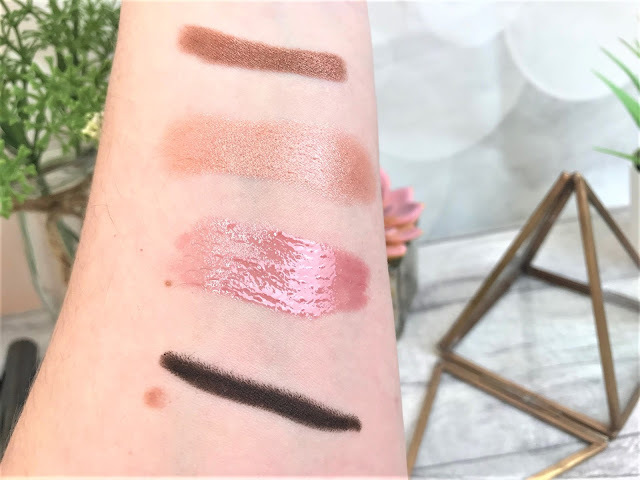 As well as on the cheeks, this can also be used on the eyes and lips, so it is perfect for travelling as it can cover so many different things - I love a multi-use product. It has a silky formula which is infused with soft-focus powders and pearl extracts for a pretty shimmery finish. 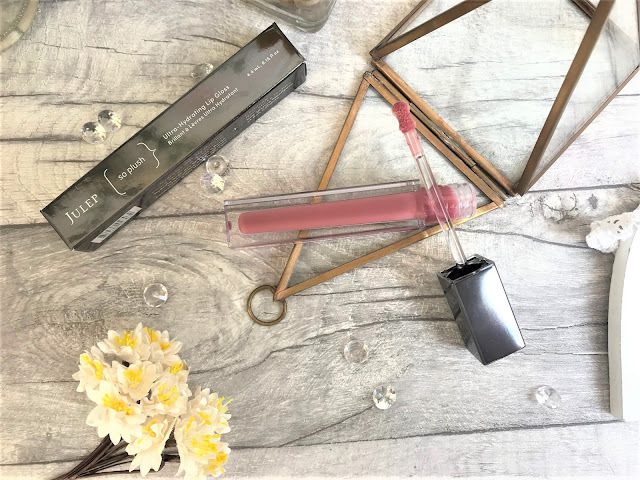 The final product I got to try was the Julep Ultra-Hydrating Lip Gloss in the shade Vibes, and again the packaging is just so high-end, it really is beautiful. As soon as I tried this on my lips, they felt so hydrated, which isn't often something you get with lip glosses. Vibes is a pretty lilac mauve shade, which will work for both day and night, and as this is a gloss, it doesn't give full coverage colour-wise, but it still leaves a great amount of colour on the lips. This gloss doesn't feel sticky on the lips and it did last quite a while to say it is a gloss, and I love how shiny and full it makes my lips look. It has an unusual shaped applicator which is made from sponge, but it still works really well at covering the lips with just one swipe. 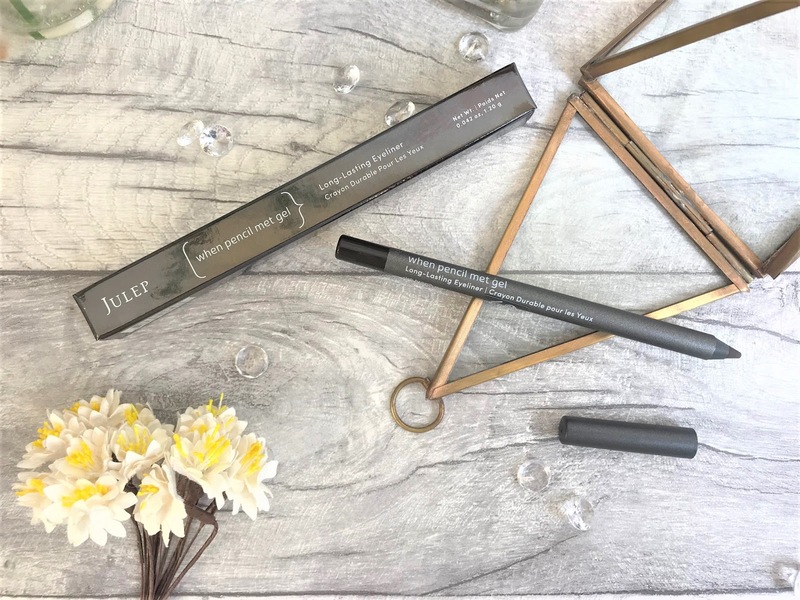 The Julep 5 Piece Effortless Make-Up Collection cost me £29.98 plus postage, which is a phenomenal price for the quality and amount of products you are getting in this kit. It is still available online at QVC, but the price is now back to the normal price of £45.00 plus postage, which is still really good value.